I'm back today with another wedding layout to share using Echo Park's Love Story collection designed by the ultra talented Lori Whitlock. For this layout I turned to my other little sister's wedding photos from almost 12 years ago (lovin' the white tuxedo). ;) This is actually my first time scrapbooking this event after passing the photos in my photo box all these years. I think weddings feel so special and important that I felt intense pressure to do them justice, but these papers made the layout fall together easily. 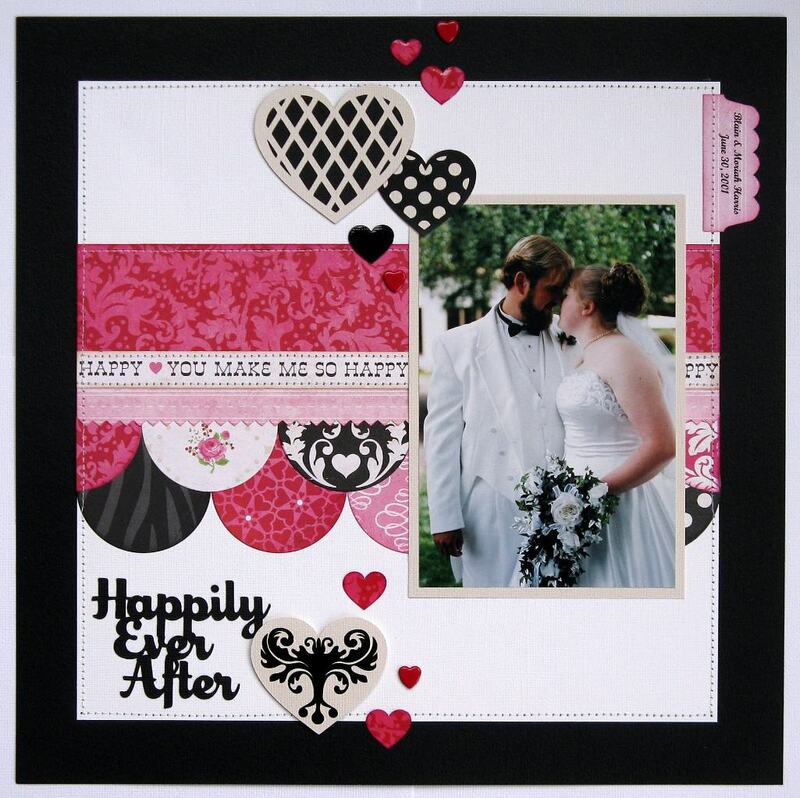 I cut and layered several hearts using a variety of Lori's heart cutting files. She has so many great choices to mix and match together and I love how the Damask Heart (cut from vinyl) matches perfectly with the patterned paper! For the pink zig-zag border that you see, I had something very specific in mind, but I didn't see that specific border available so I used Lori's 2 Borders cutting file, shrunk it down, created several duplicates and then welded them together. Using the weld feature took away the intricate diecut diamonds from the pattern which I felt would be too busy with all the differnt patterns peeking out beneath it and I was able to get extra mileage from a great border! Mendi this layout is gorgeous!!!! you definitely have an eye for design my friend! What a great page! 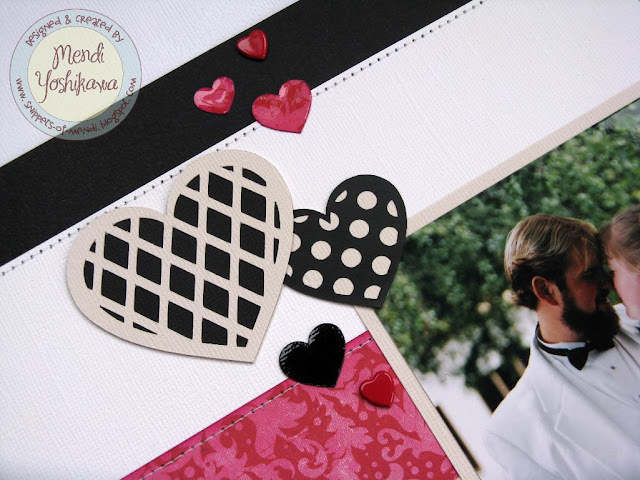 Love the design and those heart cut files you used! Never tried vinyl on my pages yet, but now I see your page I think I have to give it a try! Btw, thanks for your sweet comment on my blog today! 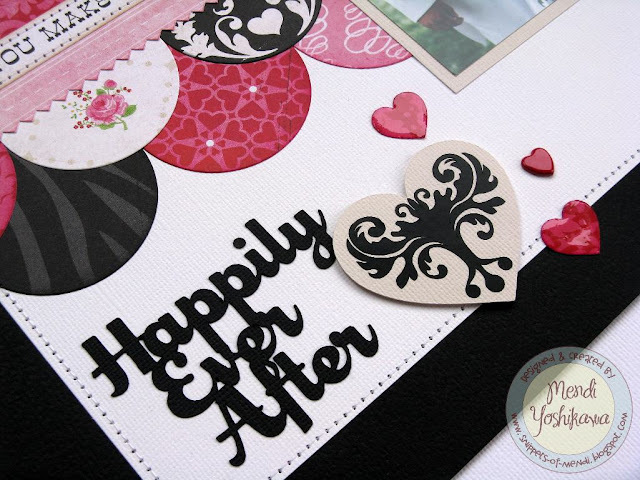 Wow Mendi, this is absolutely stunning...just love everything about it...the colors, the pretty hearts, the circle scallops and the cute little index tab tag. Just pure perfection!! !